In times long past, a handsome man called Khokhoo Namjil – that is: Namjil, the Cuckoo – lived in the far Eastern part of Mongolia. He was very famous in his district because of his extraordinary, beautiful voice. But then came the day when young Khokhoo Namjil had to join the army and he had to go to the far Western borderlands. Not much time passed before his superior realized what a beautiful voice Khokhoo Namjil had. And so the young man did not have to serve as a normal soldier but spent the next three years, the time of his service, singing. “It is nearly time for you to leave the army anyway and you have pleased us with your voice. This one time you may do as you wish, and ride with the horses for five days,” they told him. So with their permission Khokhoo Namjil drove a herd of horses until they came to a lake where he watered them. As he stood near the shore, a girl in a green silk deel – the Mongolian cloak – riding a beautiful, black horse, emerged from the water of the lake. “My parents send me to guide you to him,” she told him. “Get on my horse behind me and close your eyes,” the girl said and Khokhoo Namjil did as he was told. It felt to him as if he had just closed his eyes, when they arrived in front of the girl’s yurt, that is the special Mongolian felt-hut. The family was rich and the girl was their only daughter. The girl’s parents courteously welcomed him and asked him to sing for them. “Don’t worry about that. We will assign a man to look after your horses. In the meantime please make yourself at home and sing for us,” his host said. And so Khokhoo Namjil did stay with the family for a while and he fell in love with their beautiful daughter. “When you come, I will meet you riding my black horse,” the girl replied. But Khokhoo Namjil pleaded with him: “The time for me to be released of my duty has already come. Please let me go!” And as soon as he was free to go, Khokhoo Namjil left for the lake where he sat down at the shore and started to sing. Suddenly the girl appeared on her black horse and together they rode away and got married. But although Khokhoo Namjil lived a very happy life there, his parents and his beloved first wife were still living in the East and he had to go to see them. So the girl told him: “I will give you a good horse that is able to bring you here at night and bring you back to your work at home in the morning. But you can never let anybody else ride it. And when you ride away, please let it catch its breath in some distance from your home before you return there.” And with those words she gave Khokhoo Namjil a beautiful, pale brown horse. When Khokhoo Namjil returned home with this horse, people were very interested and they were astonished that he did not let anybody else ride his new horse. His wife wondered why he never spent one night at home but left to tend the horses as soon as the night descended. Khokhoo Namjil lead his horses into a cave and flew on his pale brown horse to the West. There he stayed overnight in the yurt of his wife with the green silk deel. Early in the morning, though, his horse brought him back home East to drive home his herd of horses. And he was always very careful to let his horse catch its breath. Three years went by and his first wife still did not know about this. But then one morning Khokhoo Namjil was late and in his haste he forgot to let his horse catch its breath driving his herd directly home. His wife who had become suspicious of him came out of the yurt and saw the pale brown horse before it got a chance to fold its wings. She whirled around, got a pair of scissors and cut the horse’s windpipe. Thus the beautiful, pale brown horse died. Khokhoo Namjil grieved for his horse and also for his second wife who he could now no longer visit. After he had neither slept nor eaten for three months he carved the head of his horse out of a piece of wood. Then he put it on top of a violin and used it to imitate the way his horse had once run across the steppe. 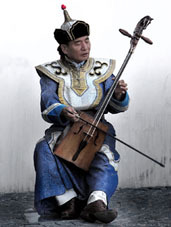 And that has been one legend of how the Morin khuur, the Mongolian horse-headed violin, originated. Copyright for translation and narration: TaleTellerin. In case you want to know more about the Morin khuur, you can find out about its (factual) history here (ignore the advertising or, of course, at Wikipedia where there’s also a sound file.